Kate and William’s Royal Tour kicked off in extreme style as predicted in New Zealand last week. Their best accessory…? Baby George! The Cambridge’s touched down in New Zealand Monday 7th April. Kate wore a red buttoned Catherine Walker coat with a matching red Gina Foster pillbox hat. Prince George looked super, super cute in a cream shorts and jumper ensemble, while William wore a navy suit, shirt and maroon tie. At the Whenuapai Air Base, Kate wore what has become her ‘signature Kate look’, wearing a Zara double-breasted blazer, Me + Em Breton shirt and navy J Brand skinnies with trademark wedges from Russell & Bromley. Visiting the city of Dunedin, Kate wore a blue/ aquamarine Emilia Wickstead dress. She paired the pleated, long sleeved dress with a matching Jane Taylor hat and fern broach. One of my favourite Kate looks of the tour so far. Later the same day Kate changed into a pair of skinny jeans and a cosy Jonathan Saunders Jumper, as the NZ All Blacks rubbed shoulders with the Royals. 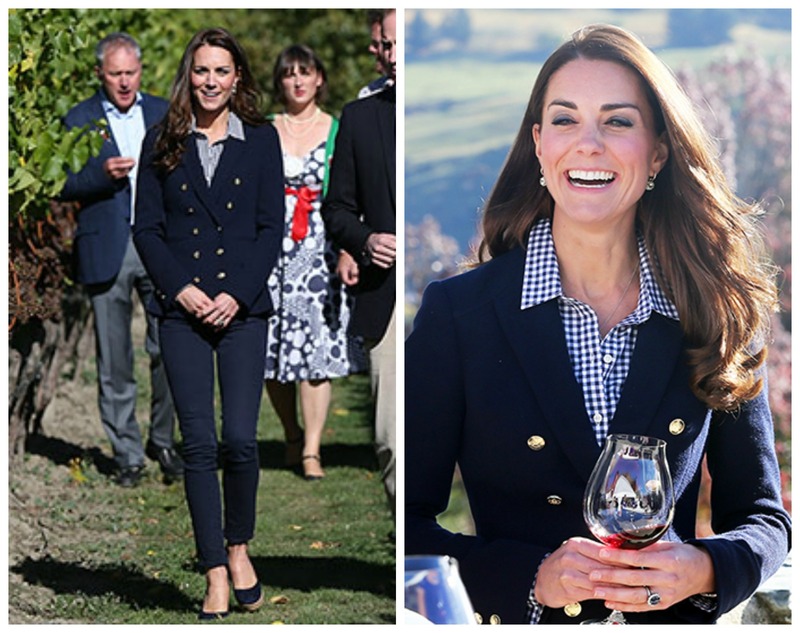 Kate rewore her J Brand jeans and Zara wedges to the Amisfield Vineyard. This time Kate styled the look with a gingham shirt. On day four of the tour, Kate wore a black custom made Jenny Packham dress as she attended an official unveiling of a portrait of Queen Elizabeth in Wellington. Wearing her hair in her signature loose end curls, Kate also kept her jewellery and shoes simple and sophisticated. Dodging the rain in extreme style, Kate donned a blue Alexander Mc Queen coat. For a change, The Duchess wore her hair tied back in an elegant ponytail. To tie the look together Kate matched her navy handbag with her navy shoes. On day 6 of the tour, Kate took a break from her blues and navys and wore a stylish green Erdem coat, styled with her black heels and a poppy broach (not visable in this picture). Again, Kate wore her hair down in her signature curls. On Prince George’s second New Zealand outing, Kate wore a printed Tory Burch dress. The ‘Kate effect’ strikes again as this dress has completely sold out. Wearing her black pumps, she carried George who wore cute navy dungarees with a sailing boat emblazoned on the chest. Here’s to another great week of style to look forward to on the Royal Tour! This entry was posted in Fashion and tagged Alexander Mc Queen, Catherine Middleton, clothes, Duchess of Cambridge, Fashion, George, Jonathan Saunder, Kate, Kate and William, Kate and Wills, Kate Middleton, Nautical, New Zealand, Outfits, Prince, Royal Tour, sold out, style, The Kate, Tory Burch, William, Zara Blazer. Bookmark the permalink. Vanessa's interests lie in all things lifestyle, beauty, fashion and health. Through vanessataaffe.wordpress.com, I aim to share some of these interests with you.